"The man in black fled across the desert, and the gunslinger followed . . ." With these words, Stephen King began what his most devout fans consider the most important story of his long and amazingly successful career. Spanning eight novels (4,250 pages), 85 comic books, a multi-part movie series, a TV show, over three decades, and millions of fans, The Dark Tower is comparable to the complete works of Tolkien. From the Wastelands of Mid-World to the streets of New York City, and many worlds between, King's western-style saga details the immortal battle of Good versus Evil, with the sense of wonder and suspense that only King himself could muster. 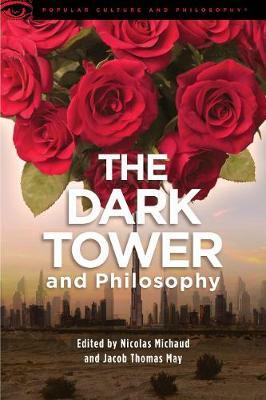 For The Dark Tower and Philosophy, the editors have searched the denizens of the Tower and its Worlds and to tell true they have found the very best wordslingers (watch out Cuthbert, for they can spin a tale, do ya kennit?) to come and help us along the paths of the Beam and get down into the questions that have plagued so many readers for years. Is the Man in Black truly evil? Is Roland? What exactly is the Tower, and why should we defend it? Does Roland have a heart? Which world is the Prime World . . . and does it really matter? Why is Roland the only one concerned about the end of all Universes? "Yes, but not for you Gunslinger." Is Roland an agent of Free Will or Fatalism? If Roland or Walter is inside someone's mind, who is that person, really? What is true heroism? Roland and Sacrifice . . . Jake/Eddie/Cuthbert/Alain/Oy . . .? Are Roland and Jake insane? Why should Jake trust Roland? What is the problem with Blaine the Mono and the [Murderous] A.I.? A murderer, betrayer and an adulterer . . . Oh, and now he killed his mother too . . . Is Roland seriously our hero? What are the politics of being a corruption-free gunslinger? Flagg's offer to abandon their quest and the fact that they refuse it--is Roland's Ka-Tet committing suicide? Roland's Ka-Tet's Excellent Adventure: Is there a problem with time travel? Are Susannah and Mia really different people? Is there a Clearing at the End of the Path . . . or just more Worlds? Is The Void utter nonsense? Why isn't King a fan of Endings? Is Roland immortal? Is that a good thing? Does anyone truly die? Nicolas Michaud is Assistant Professor of Philosophy at Florida State College Jacksonville. He is the editor of Adventure Time and Philosophy: The Handbook for Heroes and Batman, Superman and Philosophy: Badass or Boyscout? among several other books in the Popular Culture and Philosophy series. He lives in Jacksonville, FL.Jacob Thomas May is the co-editor of Deadpool and Philosophy: My Common Sense Is Tingling." He lives in Jacksonville, FL.